Eiman Nabi, MD, is a staff gastroenterologist and Assistant Professor of Medicine at the MedStar Washington Hospital Center. She is a member of the American Gastroenterological Association and the American College of Gastroenterology. Dr. Nabi specializes in gastroenterology and liver disease. Her clinical interests include the diagnosis and treatment of esophageal disorders, such as gastroesophageal reflux disease (GERD), eosinophilic esophagitis, Barrett's esophagus, and esophageal motility disorders. She uses progressive technology to diagnose and treat patients with difficulty swallowing, heartburn, and reflux, such as esophageal dilation using balloon and Savary dilator techniques, BRAVO wireless capsule for pH testing of the esophagus, and 24-hour dual-probe pH and impedance testing of the esophagus. In addition, she utilizes high-resolution esophageal manometry to measure the pressure and movement of the esophagus in order to evaluate esophageal motility. Dr. Nabi also performs hemorrhoidal banding in patients with rectal bleeding and video capsule endoscopy to evaluate small bowel lesions, in addition to upper endoscopy, flexible sigmoidoscopy, and colonoscopy procedures for a wide range of conditions. Disease of the organs of the digestive tract, including the esophagus, stomach, colon, and liver, can also affect other systems of the body. For this reason, in order to provide the most effective care and achieve optimal outcomes for her patients, Dr. Nabi emphasizes a multidisciplinary approach to gastroenterology care that involves the attention and input of physicians from other specialties, like oncology, surgery, and pathology. 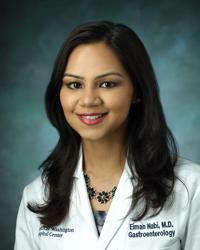 Dr. Nabi received her medical degree from Weill Cornell Medical College. She then completed a three-year residency in internal medicine, followed by a fellowship in gastroenterology, hepatology, and nutrition at the Virginia Commonwealth University in Richmond, Virginia, where she was inducted into the Alpha Omega Alpha Honor Medical Society. As part of the Gastroenterology Department at MedStar Washington Hospital Center, Dr. Nabi is part of a group of gastroenterologists that prioritize the accommodation of referral patients. “My goal is to help patients regain or improve their quality of life after being diagnosed with gastrointestinal disease. It’s important to holistically analyze the situation of each patient. This means being approachable, giving patients the space they need to feel comfortable to communicate with me, and collaborating with other physicians. Dr. Nabi was inducted into the Alpha Omega Alpha Honor Medical Society with the Brown Sequard Chapter of the Virginia Commonwealth University in May 2017 for her contribution to the education of residents and fellows during her training as a fellow/ resident.